Ah, the excitement, splendour and power of a grand adventure. If only seen through authors from the Romantic period and the majority of costume-drama filmmakers, newcomers to the planet might well think that wars and revolutions are a fine way of spending one’s days. Add some melodic lines, very occasional ensembles—along with lush orchestration—and the result can only improve. Bringing Victor Hugo’s classic novel (via a host of scribes including Claude-Michel Schönberg, Alain Boubil, Herbert Kretzmer, Jean-Marc Natel and James Fenton), next a hugely successful musical from the stage to the big screen, director Tom Hooper further expanded every aspect of the original, crafting a visual tour de force. Curiously, this mammoth production underscores the musical and textual shortcomings of the proverbial crowd-pleaser: Without stellar voices throughout most of the leads, the somewhat pedestrian tunes (take your pick) and near-cheesy lyrics (There are times when I catch in the silence/ The sigh of a faraway song) can’t be as easily forgiven (much like some famed-operas where the artists trump the plot-points with aplomb); nor can the key rivalry between Jean Valjean (Hugh Jackman) and Javert (Russell Crowe) pass the litmus test of believability/credibility as the cliché-filled scenes bring the constant adversaries together at will. 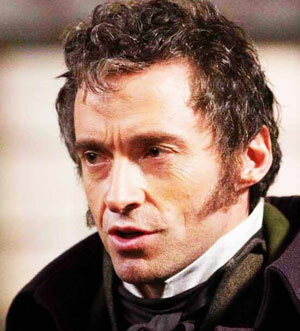 While a fine actor, Jackman is no singer. His big numbers suffer from the strain of pushing rather than supporting the musical lines. Crowe fares better as the obsessively possessed Javert, outscoring Valjean in “The Confrontation” if not in the storyline. Comparatively, Eddie Redmayne is a welcome breath of fresh air as Marius: more please.